Which fact about elephants surprised you the most? Why? Which of these facts explained something you've always wondered about elephants? Explain. Animals adapt to get what they need to survive. What elephant adaptations did you learn about after reading this list of facts? How do the adaptations help elephants survive? According to the article, farmers in Kenya are using beehives to protect their fields from elephants. What other ideas do you think the farmers could try to safely keep elephants out of their fields? 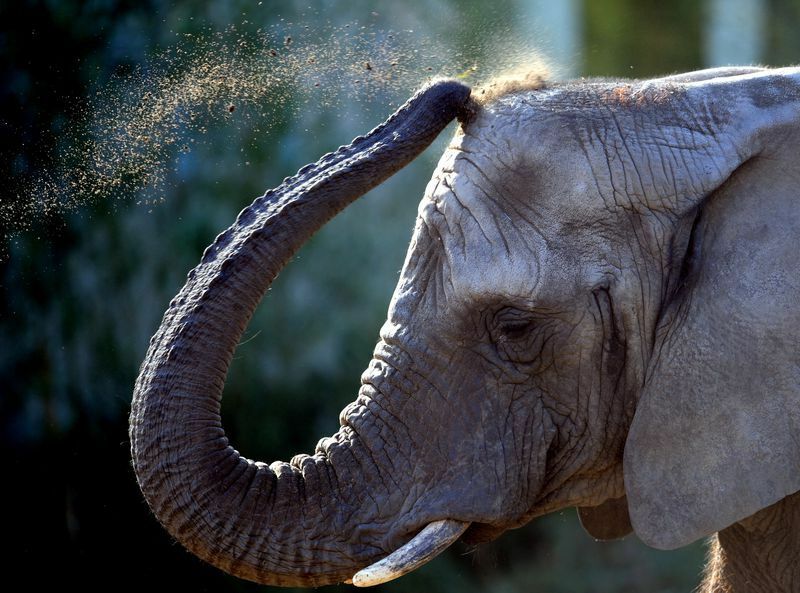 Invite students to share what they know about elephants. What are they like? Where do they live? What do they eat? How do they grow? Cover as many topics as possible. Remind students that many people are concerned about the future of elephants. Human activities have depleted elephant populations and put their future at risk. Discuss how. Inform the class that many people are working hard to keep this from happening. And one key part of their mission is education. In order for people to try to solve the problem, they have to understand what the problem is in the first place. Instruct students to conduct research to learn more about elephants. Encourage them to add facts to the article's list. Then have students use what they learned to create a poster for a Save the Elephants campaign. Invite students to share their posters with the class. Encourage classmates to identify and discuss the most interesting or unexpected facts featured on the posters. As a class, brainstorm a list of commonly known facts about elephants. Divide the class into small groups. Instruct groups to conduct research to learn more. Then give them time to create a poster for a Save the Elephants campaign. Divide the class into small groups. Have groups brainstorm a list of commonly known facts about elephants. As they do this, remind them to consider the different types of elephants and the various habitats where they live. Give groups time to create a poster for a Save the Elephants campaign. Divide the class into small groups. Have groups brainstorm a list of commonly known facts about elephants. Have them conduct research to learn more. Then instruct each group to select one fact that they think best illustrates why elephants need to be saved. Give groups time to create their posters. Divide the class into pairs. Have partners conduct research to learn more about elephants. Encourage them to focus on conflicts between people and elephants-such as farmers trying to keep elephants out of their fields-and ideas people have tried to solve the problem. Instruct partners to select one problem/solution example. Give them time to create an educational poster that will teach people about this solution and help save elephants in one specific way. Invite students to explore this website to learn about Asian elephants at the National Zoo. They will learn how they are cared for and how zoos are working to save Asian elephant populations from becoming an endangered species. Visit this website to see what Asian elephants Spike, Ambika, Shanthi, Bozie, Kamala, Swarna and Maharani are up to at the National Zoo. The webcam live-streams high-definition footage from the inside the Elephant Community Center and outside in the elephants’ yards. Asian Elephants are critically endangered and their habitat is rapidly disappearing. Watch this video to learn how Smithsonian Conservation Biology Institute scientists are working to make sure they do not go extinct. Caitlin O’Connell has been studying the interactions of elephants for 20 years. She is one of the few people who is able to translate their language and decipher their power struggles. Watch this Smithsonian Channel video to learn about her work. In Asia, the biggest threat to elephant survival has long been habitat loss. That may be changing. Read this Smithsonian magazine article to learn why. This online exhibition from the National Museum of African Art presents an array of African artistic representations of domestic and untamed animals—including elephants. Invite students to review the site to discover how animals are employed to tell the history and moral values of their makers. Is it true that elephants can't jump?